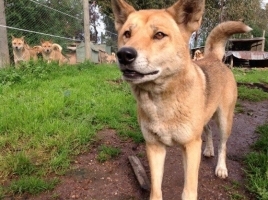 Bushland Dingo Haven is a self-funded conservation haven for more than 40 dingoes, set up by Gillian and Richard Ryhorchuk. The Haven is half an hour from Benalla, and ten minutes from Violet Town, Victoria. The dingoes live in family groups, and come from different parts of Australia. Visitors are welcome to interact with some of the dingoes, but others are quite timid. Come and learn all about them. Opening hours: Please telephone Gill to arrange a visit.